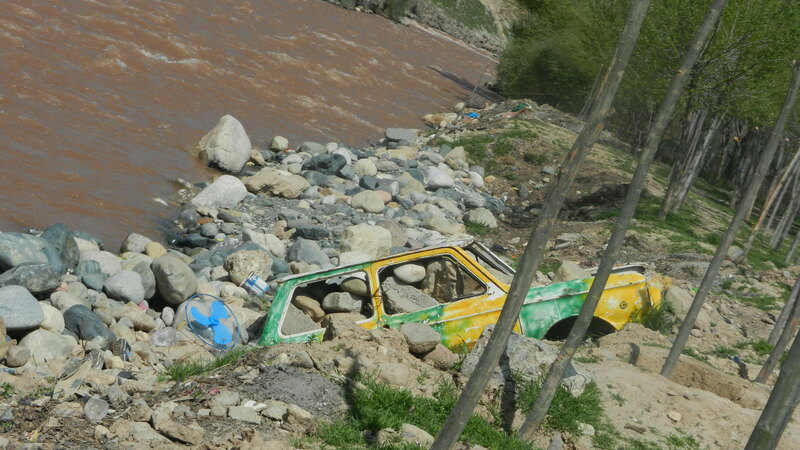 Thank you, spring time, for reminding me that I often genuinely like living in Tajikistan! O wait, sorry. Wrong photo. 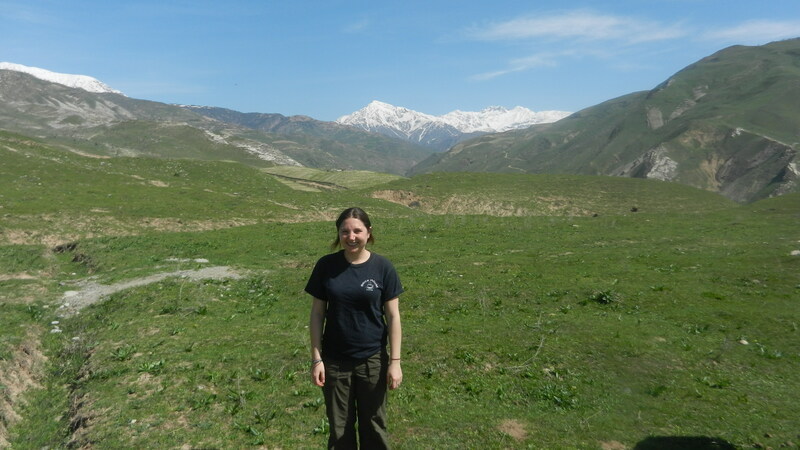 Anyways, the day trip got us out of Dushanbe for a bit, and we were able to see everything the Qoratogh valley regional tourism board recommended! Huzzah! Aqueducts were built into the side of this mountain. So then, what does the Qoratogh regional tourism board recommend? There’s this one aquaduct/tunnel, that was supposedly built in the 10th century (or the 9th. Or maybe the 11th. 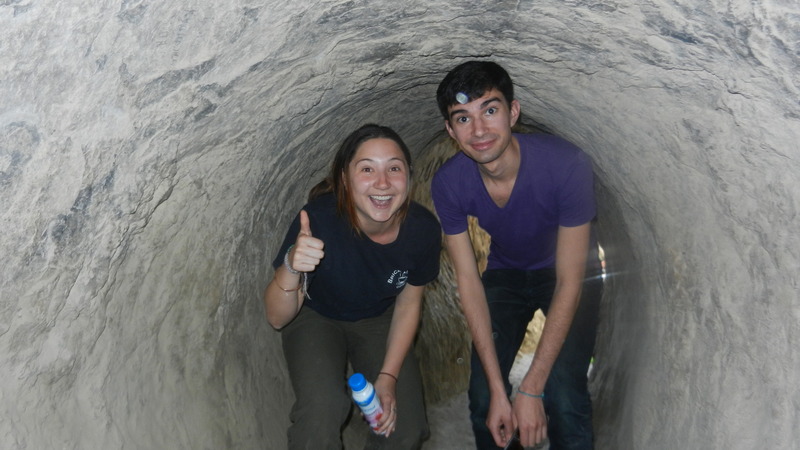 Our guide wasn’t super sure), and is called the “Tunnel of Shirin and Farhad.” Shirin and Farhad is a famous love story from Ferdowsi’s Shahnameh. Think Romeo and Juliet, but more Persian. No one knew why the tunnel was called that. Joey and I in the tunnel/aquaduct. It was cramped. After the aquaduct of Shirin and Farhad, we headed to the mausoleums of some guys who were supposedly decedents of the Prophet Muhammad. There was not any particularly clear information on what they actually did, but one of them had a father who was from Kashgar, in Western China. So that’s exciting. The real excitement was the view. Afterwards, we were told that the village want to give us tea at their Nowruzgah (literally, place of Nowruz). “Tea” turned out to be a full meal involving a delicious mint soup and some fantastic raisins. 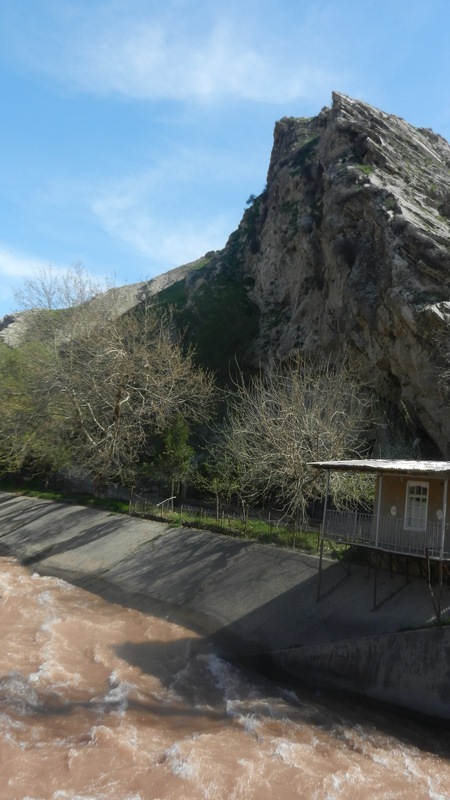 The Nowruzgah was next to the river, and we relaxed next to the water for nearly an hour before moving on to our final stop, the home of the famous Tajik poet Mirzo Tursunzoda. 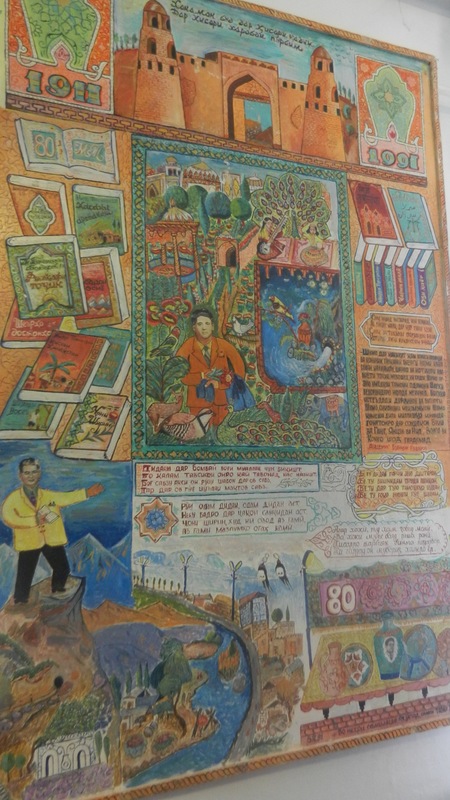 Tursunzoda was a Soviet era poet, probably the most famous Soviet era Tajik poet. He is considered a Hero of the Nation. There is a poster in my classroom that explains this. His museum was pretty neat. It featured some old Soviet stuff (coins, pictures of Stalin, etc), some old pre-Soviet Central Asian things (coins, pictures of camels, etc. ), and lots of paintings and photos of him. Tursunzoda is on the One Somoni bill. One somoni is worth about 20 cents. In other news, I have just about a month left here in Taj. That means that after 9 months, I’ll finally get a hair cut! I don’t know why I’ve developed an aversion to Tajik haircuts. It also means that in the coming weeks, you should expect a combination of excitement and nostalgia from this blog. In preparation for the end of the year, I’ve been hard at work on my term paper, which is an examination of the role of the city of Bukhara in the revival of Persian language and culture in the 9th and 10th centuries. I don’t think anyone really wants me to go into much detail here, but its pretty awesome.I hit the 1,500 word mark earlier this week, which is way more invigorating in Persian than in English. Here is a poem by Sheikh Ahmad-e Jami, a 11th-12th century Sufi. 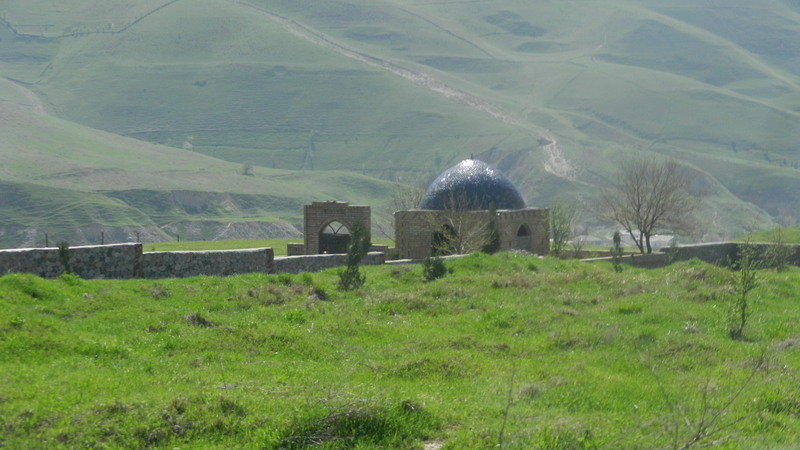 This entry was posted in Uncategorized and tagged Aqueducts, Day trips, dushanbe, Farsi, Mirzo Tursunzoda, Persian, Poetry, Qoratogh, Shahnameh, Sheikh Ahmad-e Jami, Shirin and Farhad, Sufi poets, Tajiki, Tajikistan, Travel. Hi Amanda, You are so witty and amusing . I love your sense of humor. Love your blogs!